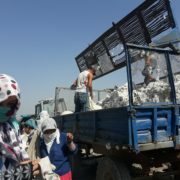 The “Human Rights Alliance of Uzbekistan” – an informal association of Uzbek human rights activists – has announced that Elena Urlaeva was arrested in Buka city for monitoring forced labor during the 2016 cotton harvest. On November 5th, Elena Urlaeva travelled to the Buka district in the Tashkent region, where the World Bank runs several agricultural projects. 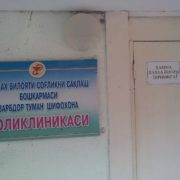 The activist went to the district educational department and asked to meet with the methodologist Khilola Djuraeva. 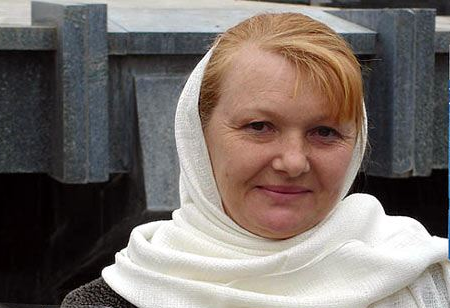 An employee of the department told her that Ms Djuraeva was dismissed on October 7th on order of the Head of the Educational Department Muhammad Asimov, because of her connections with Elena Urlaeva. The human rights activist showed the employees a letter from the Ministry of Public Edication, stating that on October 20th, the Muhammad Asimov himself had been discharged as head of the Educational Department and that his case had been transferred to the Prosecutor’s office. When Elena came out of the building, an unknown man pushed her into a car and took her to the police station. There, her camera was taken away, her phone was dismantled, and her bag was searched. Everything was captured on video. An hour later, the police brought the human rights activist to the Buka police department. She was accused of entering a “closed” city and required to write an explanatory letter indicating the purpose of her arrival. She was insulted, the officials shouted to her, claiming that because of her, the Khokim (head of administration) of the Buka city Davron Sultanov and the Head of the district Educational Department Muhammad Asimov had been dismissed. During the interrogation, the “emergency” doctor Karimbay Navruzov gave her two injections for high blood pressure. 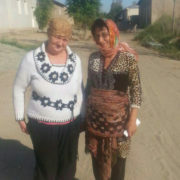 After some time, the aggression was over, and the policeman told the detainee that the order for her arrest had come from a man called Bakhtiyor (last name unknown – AsiaTerra) from the Counterterrorism Department of the Ministry of the Interior of Uzbekistan, and that her release depended on his call. Nevertheless, after 6 hours of detention, the human rights activist was released. The police apologized for the detention and paid her a taxi to Tashkent. "You have to teach 8 different subjects while other teachers were away picking cotton"
@AstrupILO This is very welcome news. It will hopefully set a precedent to make details of other prosecutions public and not protect perpetrators for "ethical" reasons. @AstrupILO @shop_cdm @Delta87org @ilo @un_uzbekistan @UNDP_Uzbekistan @UzReport @ILO_Research @cottoncampaign @ILRF @SourcingNetwork 1. @UGFHumanRights cannot report individual cases without permission from victims who fear reprisals and have little faith in reporting forced labour to @GOVuz when @GOVuz is responsible for organising it. 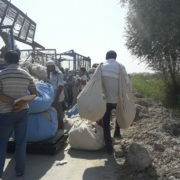 „I did not know that it is possible to call somewhere and complain that I have been sent to harvest cotton. Although I could, I still did not call“.